This is a page-turning mystery of a man, Kelly, and his efforts to escape his very difficult, vengeful Coast Guard captain, Aregood, by leaving ship and going to Key West. He is eventually pursued, however, by Aregood and Kelly has to find creative ways to escape the man that has made life in the coast Guard so miserable for him. I really enjoyed the author's first novel and the story of life in the coast guard. There were many details that were very specific to this life at sea and about the protagonist's life in Ocean City, NJ (which is just minutes from my home). That,of course, made it even more interesting to me. The other main setting is Key West which has a life of its own and is also a very fascinating part of the country.You won't regret this read. The opening dialogue is a bit confusing and the plot transitionals are not always clear, but the pacing is well-handled, the suspense is palpable, and the jargon is convincing enough to put the reader clearly in the little known world of a Coast Guardsman.The author's affinity to Key West is also appreciated by this reader. For a first novel this is quite an impressive accomplishment. EntertainingI read for pleasure and love this book. It covers details of the Coast Guard and Key West that are interesting and has a good plot. I think we'll be hearing more about this writer in the future. Very well constructed and accurate to the smallest detail. As others have noted, brings back those shared Coast Guard and military experiences that become who we are. Hats off to this great author on his first work - eagerly anticipating his next book! Couldn't put it down once I started reading. Took me right back to underway life. I could actually feel the glow of the red light on the ship and the thump from the music at Ricks. Great action from start to finish. Very enjoyable read! It was a thrilling ride that kept the pages turning, but also had heart. I loved the imagery - I felt like I was right there along with the main character - from getting seasick to hanging out in Key West! Well done! I wasn't sure what to expect with this book, but I was fortunate enough to win a free copy from Goodreads. At the time, my reading table was buried, but I finally got to this book and was pleasantly surprised. Great thriller, and I would read more from this author. A hard to put down page turner that keeps you on edge from beginning to end. A great nautical story! Bill Schweigart - Bill Schweigart revives a bit of forgotten lore from the shadow of Washington, D.C. for his chilling thriller, THE BEAST OF BARCROFT, which finds a devilish creature stalking the residents of Arlington. Its sequel, NORTHWOODS, follows Ben McKelvie and Lindsay Clark as they travel to the Northwoods of Wisconsin to investigate sightings of a new and terrifying cryptozoological threat. In THE DEVIL'S COLONY, the final novel in the trilogy, Ben and Lindsay face their deadliest challenge yet when they trace the source of their supernatural threats to a private compound in the New Jersey Pine Barrens called Välkommen. To find out the truth, they must enter the camp incognito, where they will learn that the most dangerous beasts lurk in the human heart. 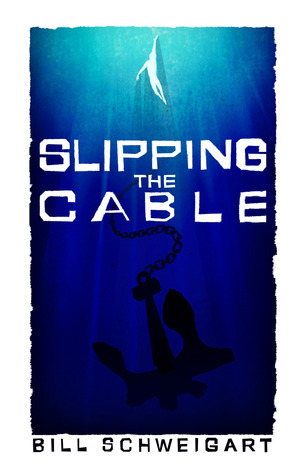 Bill is a former Coast Guard officer who drew from his experiences at sea to write the taut nautical thriller, SLIPPING THE CABLE. Bill currently lives in Arlington, VA with his wife and daughter, who along with their monstrous Newfoundland and mischievous cat, provide him with all the adventure he can handle.